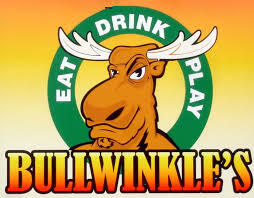 Introducing Bullwinkle’s, a friendly Sports Bar and restaurant in Brookfield Wisconsin! We are known for our wings and the exciting atmosphere. Loaded with 40 t.v.’s to watch televised sporting events, including major boxing and UFC matches, pro football , baseball and much much more! Enjoy our game room and compete with your friends and family. Bullwinkle’s Sports Bar is a family friendly place for lunch, dinner or just meeting up with co-workers and friends. Join us for daily food and drink specials! Bullwinkle’s…where friends and family go!